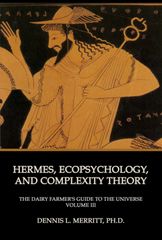 An exegesis of the myth of Hermes stealing Apollo’s cattle and the story of Hephaestus trapping Aphrodite and Ares in the act are used in The Dairy Farmer’s Guide to the Universe Volume III to set a mythic foundation for Jungian ecopsychology. This volume illustrates Hermes as the archetypal link to our bodies, sexuality, the phallus, the feminine, and the earth. Hermes’ wand is presented as a symbol for ecopsychology. The appendices of this volume develop the argument for the application of complexity theory to key Jungian concepts, displacing classical Jungian constructs problematic to the scientific and academic community. Hermes is described as the god of ecopsychology and complexity theory. The front cover image is from a photo taken by the author of detail on an Attic Greek calyx krater by Euxitheos (potter) and Euphronios (painter) ca. 515 BCE. The gap between the horn-like extensions atop Hermes’ staff highlight his domain—the exchange and interactive field between things, as between people, consciousness and the unconscious, body and mind, and humans and nature. DENNIS L. MERRITT, Ph.D., is a Jungian psychoanalyst and ecopsychologist in private practice in Madison and Milwaukee, Wisconsin. A Diplomate of the C.G. Jung Institute of Analytical Psychology, Zurich, Switzerland, he also holds the following degrees: M.A. Humanistic Psychology-Clinical, Sonoma State University, California, Ph.D. Insect Pathology, University of California-Berkeley, M.S. and B.S. in Entomology, University of Wisconsin-Madison. He has participated in Lakota Sioux ceremonies for over twenty-five years which have strongly influenced his worldview.